If you’ve met me, you know I’m very into all things practical! Especially when it comes to gifting! Nothing says I love you, I care about you and I know these things will make your life easier than giving practical holiday gifts! Let’s be real, how many times you got something on Christmas that you never actually used later? I bet a thing or two comes to your mind. 1. Bella Airfryer– Great kitchen appliance for those who love healthier alternatives to cooking food! With just 2 teaspoons of oil, you can make fries that are uber crispy and evenly cooked! 2. HUM Nutrition Supplements – What says I care about you more than a sweet treat that also supports getting stronger, healthier hair and hydrated, glowing skin? 3. Gary Vaynerchuk Crushing It! – Something for the entrepreneur and creative in your life. I’ve heard amazing things about this book and Gary himself. Crushing It! is a state-of-the-art guide to building your own path to professional and financial success, but it’s not about getting rich. It’s a blueprint to living life on your own terms. 4. CRUX Extra Large Smokeless Grill – A great gift for the chef in your life! We recently used this product for cooking a steak and veggies and it was delicious! The best part is that it’s easy to clean as well (dishwasher safe). 5. Acupressure Mat – This product really works for any kind of tension in your neck, back or lower body. If used right before bed, it improves your sleep as well! I got it for Rapha last year and we both frequently use it and love it! 6. Mini Steamer – One of our favorite practical holiday gifts! We use our steamer all the time (for clothes + for a quick facial) and we love gifting it to our friends as well. 7. Summer Friday Jet Lag + Overnight Mask– The Internet literally went crazy for these beauty products and for a good reason. Certified as clean at Sephora, these two skincare products have proven to deliver skin-loving ingredients and amazing results at first try. 8. Slip Silk Sleepmask – Luxurious, pure, one-size-fits-all sleep mask that delivers anti-aging benefits as it doesn’t tug at delicate parts of your face. Perfect for those who have trouble sleeping or those who spend a lot of time on the plane! 9. Slip Silk Pillowcase – This was the present I received last year for Christmas and it truly is a gift that keeps on giving! It works wonders because the Slip silk is so gentle, it allows skin and hair to glide across the surface – protecting and hydrating skin, reducing split ends, and ensuring a longer-lasting blow out. Perfect for those who value their beauty sleep! For a cheaper alternative, check out Amazon. 10. Mariabella Luxe Egyptian Cotton Towels – As much as I’m not into monogramming everything and anything, I thought having towels with my new family name would be a nice addition to our soon newlywed life. 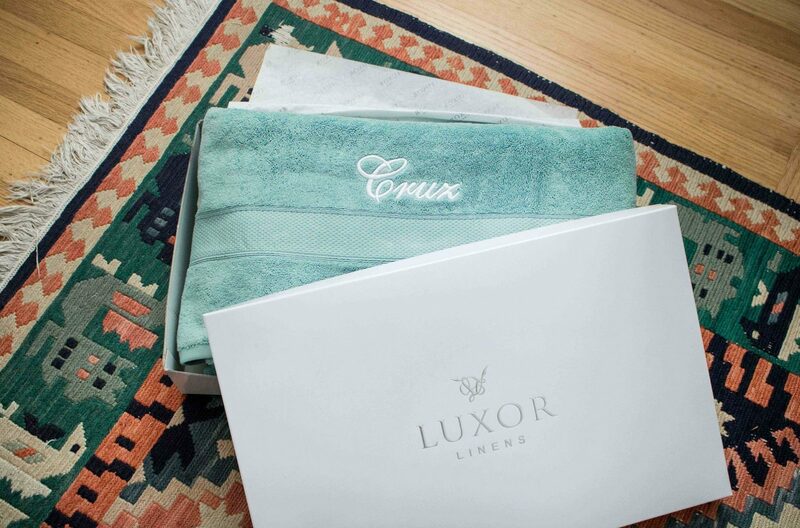 If you know your family or friends love customizing items, Luxor Linens also offers a series of bath and body products including this luxury sheet set, robes and blankets that you can get monogrammed. 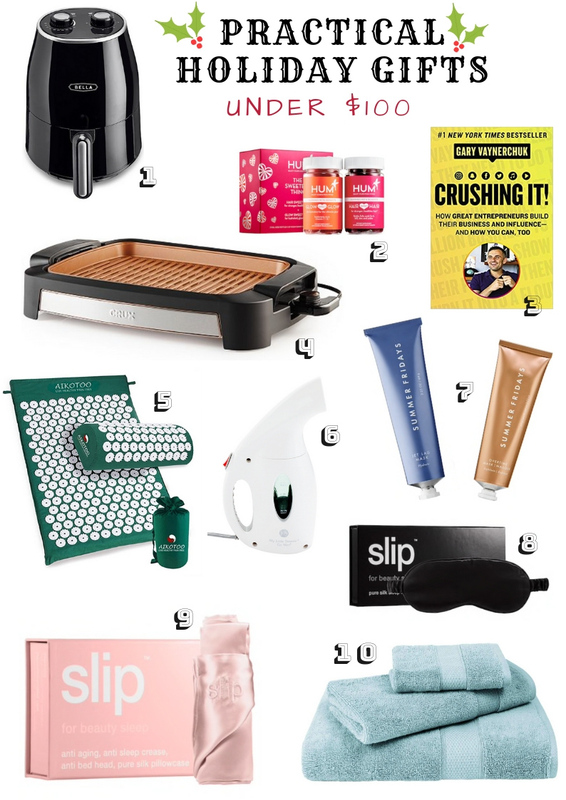 What practical holiday gifts would you add to this list? Great gift suggestions, I want most of them for myself haha!